I think it’s safe to say from my first experience with the Canadian Gemini Awards, (our equivalent of the Emmy Awards) that the true north strong and free has it all over our southern neighbours and their Emmys. I can say that with some confidence because my wife was nominated for a News and Documentary Craft Emmy this year and I was nominated for a writing Gemini. This dual award experience provided us with a unique perspective on both events. How did the Canucks manage to out-celebrate the big, bad Americans? Why, with a touch of class, a little forethought and lot of thinking ahead. First of all, the Geminis held a little reception shindig weeks before the event. That allowed everyone in attendance to relax and truly mingle as they drank and downed their gourmet champagne. No one was nervous yet and so there was precious little of that whole "people looking over your shoulder hoping for someone better to talk to” thing you run into at major functions. 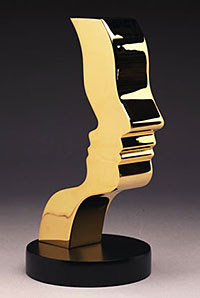 Everyone nominated was invited, not just the big names in the big categories. So there was no separation of artists and artisans based supposed importance. At this year’s untelevised Emmy Awards my significant other had to stand through a very formal and tense reception right before her awards, forbidden even from sitting at a table as she ate for fear of appearing too aloof. Few were drinking and those that did sipped, wary of overimbibing.. They were all worried about what they might have to say if they won. Would they remember everyone’s name? How much time do they have again? Or, they were trying to make those important contacts with people they wouldn't otherwise never have a chance to connect with. During the show her company was seated in the mezzanine overlooking the main hall, prompting the assumption that no one from their group could possibly have won. Why else would they seat them so far away from the stage? To their shock, two of their number did win and then the show really began. Victors carefully inched their way down the lengthy aisle. “Excuse me.” “Pardon me, please.” “One side, winner coming through.” Once at the aisle, the flush of victory still on their face and only the slightest flagging of applause to be heard, recipients then walked up to the upstairs lobby where they waited for an elevator to take them down to the main lobby so they could walk into the the auditorium and make their way to the stage! Naturally, the hosts had been given no warning as to how long it might take a winner to reach them. And the videos of each winner’s piece lasted only twenty seconds or so each. Even playing it three times would leave the hosts with five or more minutes to fill. And sadly, vamping is not generally in the skill set of most journalists. In this year’s case, the delays resulted in ad libs like the hilarious bon mot, “so… how about that economy?” Comedy gold. What a lovely way to make an extremely long show extremely longer. 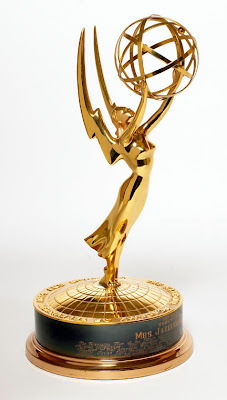 I have several potential solutions for this situation to offer the Emmys, free of charge! 1 – Have hidden cameras in the elevators so the audience can watch winners check their teeth, practice their speeches and curse out whoever seated them. That would add to the drama and give the hosts something to riff on. 2 – Hire the local SWAT to repel winners seated in the balcony down to floor level in seconds. Live action stunts are always riveting. 3 – A terrific cross-promotion with American Airlines could result in inflatable airplane slides at either side of the balcony. Just remember to ask winners to kindly remove their shoes before sliding. And hang on to your skirts ladies! So how did our untelevised Canadian nights compare? Pretty ding dang good, I must say! Though tickets were expensive we did see out money at work. The three ceremonies were held at the Liberty Grand in Toronto. So it was that on the second night we arrived for the Lifestyle, Children’s & Youth gala. It was a most glamorous evening, with the obligatory cocktails before dinner. A walk through the courtyard to the main event in extremely cold temperatures did not dampen our spirits even if it did chill our toes. The room was sleek and everyone sat close enough to the stage to get therewith expedience. Dinner was delicious, though many pondered being served a large helping of guacamole in a martini glass with only three chips. Three chips and a 1/2 lb of guac? Such a delicious waste. Sigh. As to the show, it was surprisingly brisk, though I have heard other nights with more awards to give out did drag. The bits were all short and tailored quite well to the surprising guest presenters like the Cashman himself, local jeweller and supporter of the arts Russell Oliver and Mike Holmes paying to tribute to the fine craftsmanship of his rival Bob the Builder. One interesting thing about the presentations is that many of the awards were announced two at a time. Not only did this speed things up considerably but it also gave us all something to watch as people made their way to the stage to take their turn at the acceptance speech. But how Canadian is it to wait in line for your turn to accept an award? I can picture our American cousins wrestling each other to be first at the hardware. In short, it was a fine, spirited night. And truthfully, just being nominated for the show and episode that introduced me to my wife so near to our anniversary would have made for a spectacular evening. 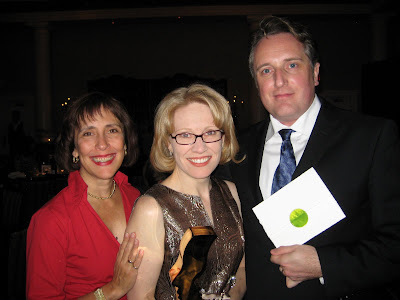 Er, then I, and the two writers who shared my award won. I mean, OUR award of course. As for me, it just puts a lovely cap on a show that gave me a woman to spend the rest of my days with. I contributed only one sentence to our acceptance speech, but it still rings true. This award is the icing on my wedding cake. Emmys zero. Canada ten. The winner... Canada.